BMW is consistently continuing the worldwide introduction of innovative technologies serving to reduce both fuel consumption and emissions. Once again, the BMW 3 Series is the pacemaker in taking this approach, boasting new technologies also in the 2010 model year developed in the context of BMW EfficientDynamics for maximum impact in this best-selling model series. As a result, the BMW 3 Series is once again extending its leadership over the competition in terms of efficiency. A new straight-six petrol engine with BMW TwinPower Turbo Technology, High Precision Injection, and VALVETRONIC in the BMW 335i, an equally new straight-six diesel with an all-aluminium crankcase and common-rail direct fuel injection in the BMW 320d, extra muscle and traction for the BMW 320d and the BMW 318d, as well as the introduction of the BMW 316d Touring make the model range even more appealing and versatile than ever before. A further important highlight is that all model variants of the BMW 3 Series now fulfil the EU5 emissions standard. And with optional BMW BluePerformance technology, not only the BMW 330d Saloon, but also the BMW 320d Saloon and the BMW 320d Touring are now becoming the first four-cylinder models to fulfil the EU6 emission standard not even coming into force until 2014. Both the Saloon and Touring models are available in the 2010 model year with a choice of no less than five petrol and six diesel engines, the range of power extending all the way from 85 kW/115 hp in the BMW 316d to 225 kW/306 hp in the BMW 335i. Choosing from the petrol models, customers have the choice of no less than two four- and three six-cylinder engines, while the portfolio of diesel engines now comprises three four- and three-six-cylinder power units. The BMW 320d EfficientDynamics Edition holds a very special position within the range in supplementing the line-up of BMW 3 Series Saloon models: Developing maximum output of 120kW/163 hp on fuel consumption in the EU test cycle of just 4.1 litres/100 kilometres (equal to 68.9 mpg imp), and with a CO2 rating of 109 grams per kilometre, this special model powered by a 2.0-litre four-cylinder diesel offers by far the best balance of driving pleasure and fuel economy in the midrange segment. The choice of all-wheel-drive models in the BMW 3 Series is likewise even greater than ever before, with BMW’s intelligent xDrive all-wheel-drive system available on no less than three petrol and two diesel models. BMW EfficientDynamics: featured as standard in every BMW 3 Series. The BMW 3 Series already holds an outstanding position in the midrange segment as the epitome of driving dynamics and the absolute trendsetter in terms of efficiency. Indeed, the unique characteristics of the BMW 3 Series combining superior Sheer Driving Pleasure with exemplary fuel economy and emission management, is the result of the BMW EfficientDynamics development strategy – and the innovations introduced as part of this strategy are offered in an appropriate combination as standard in each BMW 3 Series. This guarantees that the BMW 3 Series in all power and performance classes offers an unusually good balance of Sheer Driving Pleasure and fuel economy all round. Turbo Technology and fully variable VALVETRONIC valve management. In the interest of optimum weight, the power units in the BMW 335i, the BMW 320i and the BMW 318i come with an aluminium crankcase, while the six-cylinder naturally-aspirated engines in the BMW 330i and the BMW 325i boast a composite magnesium/aluminium crankcase even lighter than before. The diesel engines in the BMW 3 Series likewise come in a low-weight aluminium construction. On both the six- and four-cylinder diesels, third-generation common-rail direct fuel injection ensures an optimum supply of fuel at all times. Turbochargers with variable intake geometry and Variable Twin Turbo Technology on the BMW 335d ensure an ideal combination of sporting performance with excellently low fuel consumption and emissions. The wide range of BMW EfficientDynamics technology featured on all models in the BMW 3 Series includes Brake Energy Regeneration, concentrating the generation of electric power for the on-board network on overrun and application of the brakes. Whenever the engine is pulling the car, on the other hand, that is in the traction mode, more power is available for enhanced driving dynamics. The manual gearbox four-cylinder models in the BMW 3 Series also come with an Auto Start Stop function helping to avoid any additional consumption of fuel when the engine is idling. All models with manual gearbox are furthermore equipped with a gearshift point indicator telling the driver the right time to shift gears in the interest of minimum fuel consumption. Intelligent lightweight technology, special tyres with minimum roll resistance and optimised aerodynamics further enhance the efficiency of the BMW 3 Series to an even higher standard. Ancillary units masterminded according to current requirements and appropriately combined in each model – such as Electric Power Steering, an oil pump controlled on-demand, the detachable a/c compressor, active cooling air flaps as well as the transmission and final drive optimised for maximum efficiency – likewise serve to reduce both fuel consumption and emissions. BMW BluePerformance technology now featured for the first time also in a four-cylinder diesel: the BMW 320d fulfilling the EU6 emission standard. 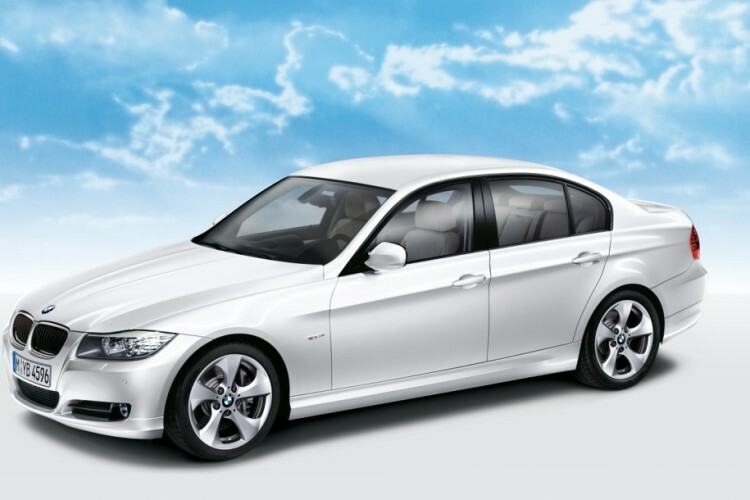 Entering the 2010 model year, all models in the BMW 3 Series naturally fulfil the EU5 emission standard. At the same time BMW is further extending its leadership in the introduction of innovative exhaust management technologies to fulfil the EU6 standard not even coming into force until 2014. Optional BMW BluePerformance technology serves to reduce nitric oxide emissions (NOX) for this purpose, without in any way impairing the performance and fuel economy of cars equipped with this technology. The first model equipped with BluePerformance in order to fulfil the EU6 standard was the BMW 330d Saloon. Now this trendsetter is being followed by the BMW 320d Saloon and the BMW 320d Touring as the first four-cylinder diesels available on request with BMW BluePerformance. Supplementing the diesel particulates filter and the oxidation catalyst housed in one unit on all diesel models, BMW BluePerformance technology incorporates an NOX storage catalyst to provide a further reduction of nitric oxides in the car’s emissions. A catalytic process triggered by the coating on the NOX storage catalyst binds nitric monoxide and nitric dioxide to the barium carbonate elements integrated in the catalyst itself, the barium nitrate formed in this way being completely burnt by the engine running briefly with a larger share of fuel provided by a subsequent injection process. The reduction of nitric oxide ensured by BMW BluePeformance technology remains unnoticed to the driver, with the NOX storage catalyst being maintenance-free throughout the entire lifecycle of the car and not requiring any additional substances. Since the additional combustion processes are short and precise, this subsequent treatment of the exhaust gas does not have any influence on the car’s fuel consumption. BMW 316d: entry-level model now also available in Touring guise. The 316d Saloon already holds a strong position at the lower end of the model range as the most economical opportunity to enjoy the driving pleasure so typical of a BMW. The car’s 2.0-litre four-cylinder diesel develops 85 kW/115 hp at an engine speed of 4,000 rpm and delivers maximum torque of 260 Newton-metres/192 lb-ft at 1,750 rpm. And now this particularly fuel-efficient, low-emission diesel engine is also available in the Touring version of the BMW 3 Series. The entry-level diesel comes complete with an aluminium crankcase, a turbocharger system with variable turbine geometry and the latest generation of common-rail direct fuel injection. It accelerates the BMW 316d Touring from a standstill to 100 km/h in 11.2 seconds and gives the car a top speed of 201 km/h or 125 mph. Average fuel consumption of the BMW 316d Touring in the EU test cycle is 4.5 litres/100 kilometres (equal to 62.8 mpg imp) and the CO2 emission rating is 119 grams per kilometre. BMW 320d and BMW 318d with even more traction and pulling force. Further improvements now give the four-cylinder diesel engines in the BMW 320d and the BMW 318d even higher traction and pulling force. Maximum torque is up in both cases and the engine of the BMW 320d now develops a peak power of 135 kW/184 hp. Following the BMW EfficientDynamics strategy, the extra driving pleasure on these models furthermore comes with an additional reduction of both fuel consumption and emissions. The BMW 320d and the BMW 318d are likewise powered by 2.0-litre all-aluminium engines featuring turbocharger technology with fully variable turbine geometry and common-rail direct fuel injection. The extra power and efficiency over the former models results in this case from consistent optimisation of the combustion chambers, the turbocharger system and the cylinder head, as well as re-arrangement of the engine’s ancillary units serving to reduce frictional losses. The injection system using magnetic valve injectors operating at a pressure of up to 1,600 (BMW 318d) and, respectively, 1,800 (BMW 320d) bar ensures precise dosage of fuel at all times as well as a smooth, consistent and low-emission combustion process. Maximum engine power now increased by 5 kW to 135 kW/184 hp in the BMW 320d comes at 4,000 rpm, peak torque up from 350 Newton-metres (258 lb-ft) to 380 Newton-metres (280 lb-ft) is maintained all the way from 1,900 – 2,750 rpm. The new power unit accelerates the BMW 320d Saloon from a standstill to 100 km/h in 7.5 seconds, with the BMW 320d Touring completing the same exercise in 7.7 seconds. Top speed is 235 km/h (146 mph) on the Saloon and 233 km/h (144 mph) on the Touring. Despite this increase in engine power and performance, average fuel consumption in the EU test cycle is down to just 4.7 litres/100 kilometres (60.1 mpg imp) (Touring: 4.8 litres /58.8 mpg imp). The respective CO2 ratings are 125 grams per kilometre for the Saloon and 128 grams per kilometre for the Touring. Delivering maximum output of 105 kW/143 hp, the power unit featured in the BMW 318d comes with peak torque up by 20 Newton-metres/15 lb-ft to 320 Newton-metres/236 lb-ft delivered at a low 1,750 rpm. As a result of this higher torque, acceleration to 100 km/h in the BMW 318d Saloon now takes just 9.1 seconds (Touring: 9.4 seconds), while both models – Saloon and Touring – reach a top speed of 210 km/h or 136 mph. Average fuel consumption in the EU test cycle is now 4.5 litres/100 kilometres (equal to 62.8 mpg imp), the CO2 rating is 120 grams per kilometre. More power, greater efficiency: the BMW 325d with its new six-cylinder diesel engine. The new BMW 325d likewise combines an even higher standard of driving pleasure with a further reduction of fuel consumption and emissions. This new model is powered by yet another representative of the new generation of BMW straight-six diesels. Like the power unit featured in the BMW 330d, this new engine also comes in an all-aluminium construction and features a turbocharger with variable turbine geometry as well as the latest generation of common-rail direct fuel injection. In the version powering the BMW 325d, this new six-cylinder diesel develops maximum output of 150 kW/204 hp – 5 kW more than in the previous model – at an engine speed of 3,750 rpm. Maximum torque is up from the former model by 30 Nm/22 lb-ft to 430 Newton-metres/317 lb-ft, and now comes at 1,750 rpm. Benefiting from this kind of torque and power, the BMW 325d Saloon accelerates from a standstill to 100 km/h in 7.0 seconds (Touring: 7.2 seconds). Top speed is 242 km/h or 150 mph (Touring: 240 km/h or 149 mph). The new six-cylinder diesel also sets a new benchmark for efficiency through its average fuel consumption in the EU test cycle of 5.7 litres/100 kilometres (equal to 49.6 mpg imp) (Touring: 5.8 litres/48.7 mpg imp) and a CO2 rating of 151 grams per kilometre (Touring: 153 grams). Efficiency and maximum power all in one: the BMW 335i featuring BMW TwinPower Turbo, High Precision Injection and VALVETRONIC for the first time. The most powerful version of the BMW 3 Series likewise comes with an even higher level of efficiency in the 2010 model year: The new BMW 335i stands out in particular through the supreme muscle of its 225 kW/306 hp straight-six now combined more than ever before with a level of economy quite unique in this performance class. Precision Injection and fully variable VALVETRONIC valve management. The new six-cylinder boasts a turbocharger system applying the TwinScroll principle to separate the ducts of three cylinders at a time both in the exhaust manifold and in the turbocharger itself. This particular configuration ensures a smooth and direct surge of power with immediate response even at low engine speeds, High Precision Injection interacting with newly developed multi-hole injectors positioned in the middle of the cylinder head between the valves and in the immediate vicinity of the spark plug for particularly precise dosage of fuel into the combustion chambers. To further optimise the development of power and the superior efficiency of the engine, fully variable VALVETRONIC valve management masterminds valve stroke and intake valve timing in an infinitely variable process. This reduces throttle losses in the charge cycle to a minimum and makes particularly efficient use of the energy in the fuel. And last but certainly not least, engine response is also even better, more dynamic and smoother than before. The engine delivers its maximum torque of 400 Nm/295 lb-ft all the way from 1,200 – 5,000 rpm, and reaches its maximum output at 5,800 rpm. This accelerates the new BMW 335i Saloon from a standstill to 100 km/h in just 5.6 seconds (Touring: 5.7 seconds). Top speed is limited electronically to 250 km/h or 155 mph. Perhaps the most impressive point is that both models combine this sports car performance with a further reduction of both fuel consumption and emissions, with fuel consumption in the EU test cycle of just 8.4 litres/100 kilometres (33.6 mpg imp) on the Saloon and 8.5 litres/100 km (33.2 mpg imp) on the Touring, plus a CO2 rating of 196 grams per kilometre (Touring: 199 grams). All models fulfil the EU5 emission standard. Following the BMW 330d Saloon, the BMW 320d Saloon and the BMW 320d Touring now come with BMW BluePerfomance for the EU6 standard. Even greater driving pleasure thanks to optimised power units in the BMW 320d and the BMW 318d, entry-level BMW 316d also in the Touring model.